Deep dish, thin crust, butter, cornmeal? How about upside down? Who makes the best Chicago pizza? Lou Malnati, Giordano’s or Uno’s, the chains plus the multitude of local pizzerias that claim the best “Chicago” pizza. So you see coming to Chicago for pizza is serious business! Chicago pizza and grinder company was our choice for Sunday after we checked into our Hotwire 4-star hotel right on Michigan Ave! Chicago Pizza and Grinder is a local spot with a very unique pizza! It’s more of a pizza potpie served upside down! Awesome! We arrived and there was a 1 hour wait, Paul hates waits but I had been here before and insisted it was worth it. The owner is in charge of the wait list and there is no list! You check in with him and he will find you when it’s your turn. I’m thinking no way, the place is packed, people are everywhere but exactly 45 minutes from when we checked with he came and told us we were next! We were seated and had our order placed in exactly 1 hour from when we arrived. That’s the reality of having pizza in Chicago. 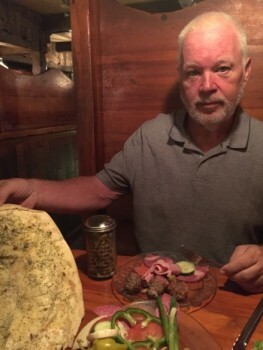 Posted in Illinois | Comments Off on Deep dish, thin crust, butter, cornmeal? 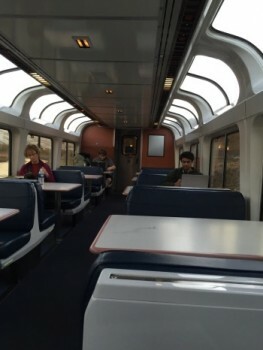 Trains hold a fascination for Paul that most don’t understand, which explains why we are riding on the California Zephyr from Emeryville CA to Chicago, Il with the intention of having pizza when we arrive! 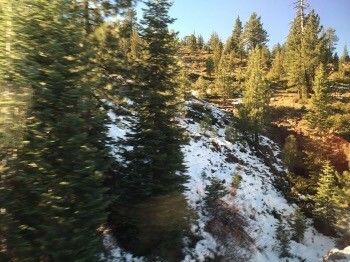 So far it has been a great trip, thru the Sierra Mtns with a short stop in Reno. 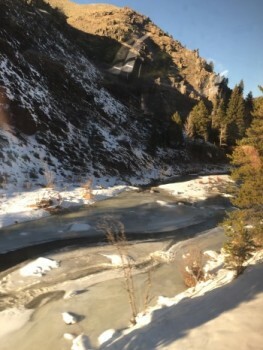 Today we saw some spectacular scenery in Colorado. Paul sprouted this idea after my trip from San Jose to Eugene Oregon in June. 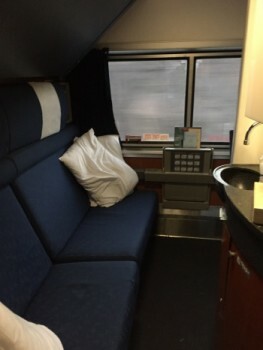 This time we upgraded to a sleeper cabin that allows for us to stretch out and actually sleep! 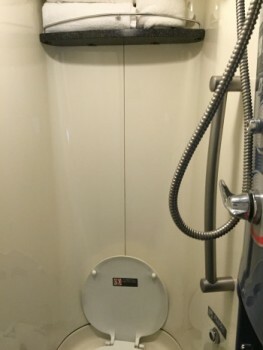 We will be on the train two and a half days so we got the best room that comes with two bunks, a chair, toilet and a private shower. Its very cozy for two people, electronics and clothing! 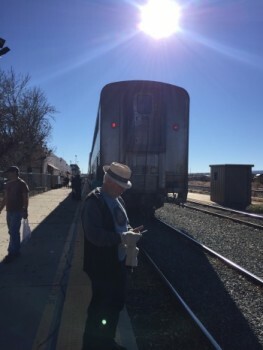 The good news is you can move about the train. 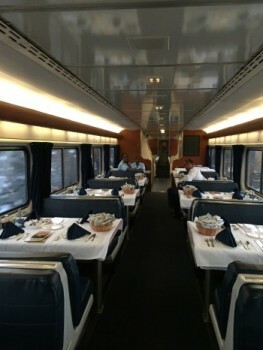 There are 6 cars for passengers; 2 coach, an observation car, dining car, and 2 sleeper cars. 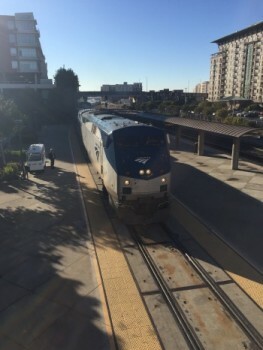 Emeryville is the beginning of the route with lots of stops before we arrive at the final destination of Chicago. 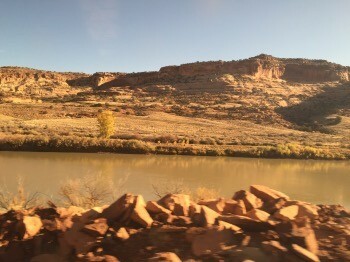 The train takes you across landscape that you can’t see by car. 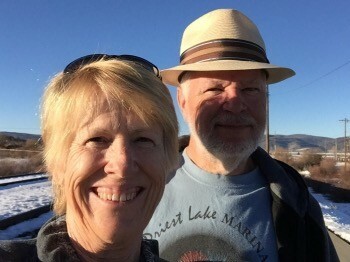 We saw Eagles today, lots of mule deer, cows, a couple coyotes, trout, ducks, frozen ponds and streams, and a very large moon in the middle of the day! 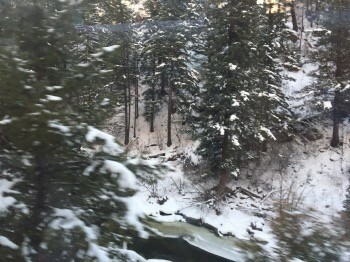 Right in the middle of the forest across the Colorado River some guy shared with the whole passing train! None were impressed! Tonight we head across the plains of Colorado and Nebraska, not much to see so we will sleep well knowing we aren’t really missing anything!